The Design Sprint is a hot topic in the digital development space and becoming increasingly popular in the charity sector. True to our mission, we wanted to share best practices in the community, so we gathered four panelists to discuss and discover how it’s working in the not-for-profit sector. Follow the structure in the book at least a few times before flexing the framework to suit your needs. It can and should be flexed. Get a good mix of committed people in the room and an empowered decision maker. Organise real people to test with ahead of time. Use Design Sprints to reduce months of work into just 5 days and be confident about whether an idea is worth taking forward. The evening kicked off with a presentation on Design Sprint Basics from Giulia Merlo; Lead Proposition Manager at Cancer Research UK. Giulia’s job at Cancer Research UK is to deliver improved digital practices and ways of working to the organization. She and her team have been trialling Design Sprints and monitoring whether the process adds value and delivers more impact. Check out the full slide deck. The Design Sprint process was first used by Google teams before moving to Google Ventures, where it was iterated by Jake Knapp. It heavily relies on the lean and agile methodologies and human centred design principles. Knapp, Zeratsky and Kowitz, 2016: "Sprint: How To Solve Big Problems and Test New Ideas in Just Five Days"
Start by assembling the team, which will need to include a Decider and a Facilitator. The Decider is usually from the business team, and must be bought into the principle of the Design Sprint, otherwise it’s likely they will go away and change their mind. The Facilitator should ideally be someone who is familiar with agile ways of working, they must be able to keep the energy going and keep the team motivated. Cancer Research UK has found that Design Sprints are a good opportunity for self organising teams once these two roles are sorted: the group can be mixed, with people from product, UX, engineering, design etc. You will need commitment from everyone to be there for the whole duration and you need to be in the same room for the whole time too. By the end of the day you should know what you are doing and be nicely aligned. It’s a structured way to give everyone the space to step back and think, in order to produce the best ideas. You do it without others seeing your ideas and you give them into the facilitator at the end of the day. The team decides with structured, silent dot voting; and if you get stuck the decider will move it forward. They must be empowered to make these decisions in the room there and then. This can be the most challenging day to keep people together, especially if you are using a prototyping tool that only a few people know how to use. However someone also needs to write the script for testing on Friday, etc, so there is a division of tasks. - Even if the first idea is not right, you can go back to the other ideas and test those. That becomes a quicker process as you’ve already worked through a bunch of the thinking. After a great introduction from Giulia, we invited three other members of our community – Sam Joseph, Cofounder of Agile Ventures, Dan Sofer, Founder of Founders and Coders and Vicky Stephens, Project Manager at the Institute of Physics – to join a panel, which was moderated by Marc Goblot, co-organiser of the Open Charity Meetup. The process starts with framing questions as ‘how might we’, which helps remove preconceived ideas; and keeps it focused on the the outcome trying to be achieved. A pre-meeting to draft a goal to kick off the conversation can be useful, it inevitably changes, but it is a starting point. The key thing is getting feedback without having to build something - and from representative individuals. This helps shortcut a potentially very long winded process of weeks or months, to getting feedback in days. It needs to be “just good enough” to be representative and to get some real feedback. That’s the core! At Cancer Research UK they are quite orthodox about the process, their philosophy is if someone can’t commit to five days, then it cannot be important enough to them to make it happen. Connecting business representatives with the digital team is a valuable part of the process. Pro tip! - Yes, you can and must adapt the process to your own needs. Use the ideas rather than being too rigid with the timetabled process. Having a decision maker in the room is imperative to the success of a Design Sprint. Getting the right people in the room is useful as they can triangulate the issues much more quickly. It’s best to have people that interact with the service users. It’s also vital to bring data and insight, which the teams can work from, rather than basing the prototype on assumptions or opinions. Defining what success looks like upfront is important, as is calling it out if it fails. Part of the challenge is convincing teams it’s ok to fail. It’s easy for the prototypes/ experiments to lose steam unless the teams are given explicit responsibility to take it forward beyond the Design Sprint, make sure you plan it in. 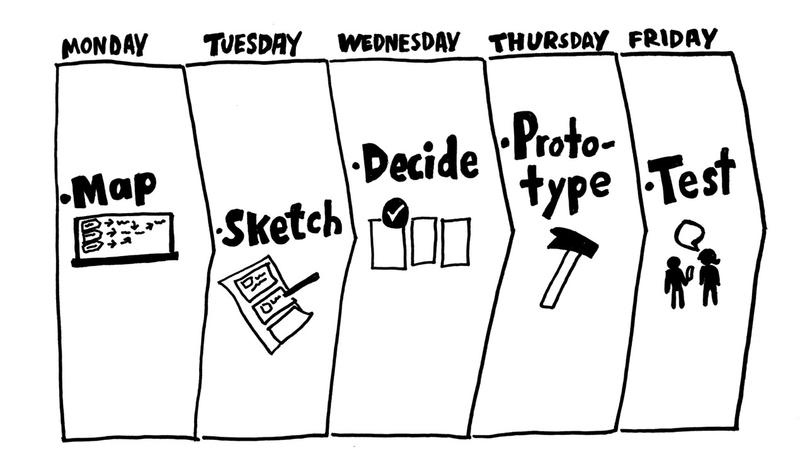 Some teams will not start a Design Sprint unless they know they have the time to continue working on it. If you embed it in your development process and workflow it will not be considered an add-on, just the way you work. One of the biggest dangers is it doesn’t get tested and the ideas don’t progress - so having the users lined up to test with is crucial. A good facilitator has to be able to help stop the process bouncing back and forth and help the group land on an idea, and using the Decider to resolve any blocks. If it’s possible for team members to volunteer their time based on their own availability and if they think they can add something to that problem this can add to their motivation. Having a mix of expertise in the room is helpful for working through the ideas. It’s important to focus on what's possible, rather than get bogged down in what’s practical. Destroying assumptions is the best part of the process. Ultimately it comes back to using one week to test this idea with real feedback, which is much cheaper than chatting about it internally for months and months, you have something tangible with evidence to take forward. Learning something about your supporters/ users has value, whatever it is you have learnt. The process has value as it shortens months of work into a week. Five days is enough to give you confidence that an idea is worth taking forward. The key is this is an experiment, it needs to be clear and not a mixture of too many things. Recruiting the testers is one of the hardest parts of the process! Getting the right property in front of the right people is the clincher. Feedback from real people is invaluable. It’s important to be able to kill ideas. It’s a culture shift to be ok with ideas not working and failing. Many thanks to our wonderful speakers for an insightful discussion. Huge thanks to Friends of the Earth for hosting the December meetup, and also to Compucorp for sponsoring the beer and pizza. Compucorp are the good folks that build CiviCRM and CiviHR - open source platforms for the charity sector, compatible with Drupal, check them out. PS - AirBnB design team use testing tool ‘Another Lens’ to test the bias of the design team, and our community highly recommends it.